There are two types of these, likewise in various finishes, sizes and prices. The first is the plain type, just an ordinary but very small hinge, used on boxes, compacts, or on bracelets which have a locking clip at the other end. The most popular type for bracelets however, is the spring-hinge. These as it will be noted in Figure 66H have a coil-spring in the center, and are curved to a slightly smaller radius than the inside of the bracelet, thus keeping it firmly clamped to the wrist. All hinges are attached with drive-screws. There is an infinite variety of special designs and shapes of bracelet hardware, such as safety catches and so on, which it is not necessary to describe as they are not standard merchandise, but are made to the fabricator's specifications. Buckle Tongues These likewise are made in infinite variety, usually to special design and order, but there is one standard type with which the craftsman should be familiar. This is sketched in Figure 66-1. As will be seen, it consists only of a cross-piece of brass wire, and a stamped tongue. The tongues come in various lengths but the cross-wires are uniform length, and are cut off to the proper length by the fabricator. In use, the plastic buckle shape is cut out to the desired shape, and holes for the wire are drilled thru the center, top and bottom. The wire is then cut so that it is about 1/8" or 1/4" longer than the open space, and in the assembly, it is bent, forced into the holes, and straightened again. This type of buckle-tongue is used for belt-fabrics that require a small hole for the tongue—where the belt-material will permit a larger hole, the tongue is frequently made of plastics, using the wire in the same manner as a hinge, the tongue sometimes being a different color material than the body of the buckle. Other types of buckles are made with a little brass fitting, resembling a hook-and-eye, attached to the back of two pieces of plastics, in any shape, such as two leaves, two flowers, or merely two oddly-shaped blocks, with the ends of the belt-material looped, sewed or otherwise attached to the buckle-parts. A typical design of hook-and-eye is illustrated in Figure 66J. Brass Wire and Strip The handiest and most universally-used "finding" of all is a spool of brass wire. (In speaking of "brass", we include all various hardnesses, spring bronzes, etc., all of which are usually nickel—or nickel-silver-plated). Occasionally, German silver or other alloys are used, and also chrome-plate, and in the better grades of merchandise, gold and silver plating, and antique or colored finishes of various kinds. This wire, in sizes from around 22 to about 12-guage, is used for various hinge-effects (such as the all-plastic bracelet sketched in Figure 66N), for attaching one piece to another, wrapped around a piece of plastics or set into a groove as ornamentation (See Figure 66L). As stated in the chapter on Finishing, it must either be previously plated or finished, as it cannot very well be polished at the same time and by the same materials as the plastics. A small bit of polished shining metal will provide a great deal of decorative value. This wire comes in the ordinary round and square shapes, as well as in a variety of ornamental shapes, such as flat crowned strip, and embossed strip. The latter has some kind of design embossed on it, varying from a simple notch or rope design to the depressions into which a string of glass brilliants are set, and may be either drawn, cold-rolled or cast. In the more ornate forms, it is called "gallery wire", the most common use of which is in jewelry and similar articles, where it is set on edge to form the setting for stones, etc. All of these types have found some use in the plastics field, but are without the range of this book to discuss. Ornaments, Etc. These likewise are more for professional use than amateur, as they can only be bought to special order and in quantity. They come in infinite variety, are usually in cast bronze or brass, furnished in the rough state, to be tumbled, polished, colored or plated. Some are in the shape of floral wreaths, others are anchors, scotties, antique designs, animals, initials, leaves and so on. They are attached either with drive-screws or occasionally with cement. An intricate and a simple design are illustrated in Figure 66M. Other fittings are ball feet for clocks, half-round tacks, star tacks and various other shapes, all attached by driving the tack-point into a hole of suitable size, hot or cold. Drive-Screws This comparatively recent invention, the Parker-Kalon Drive Screw, has proven a great boon to the plastics industry, as it has to many others. The PK drive-screw is a hardened steel screw having a rounded unslotted head and a shank which has a short, plain round section at the point, which is inserted into a hole into which it is a snug fit, and very coarse deep threads on the balance of the shank. These threads are about 4 to the inch, cork-screw style (Figure 68) and the flukes stand out sharply. When the point of the screw is placed in the hole drilled and the head of the screw struck with a hammer, these sharp flukes cut their own threads as they go down, forming a very strong joint with a minimum labor. They come in all lengths, but the most common for use with plastics are the 3/16", 1/4" and for all of which a No. 55 drill is used. It is not necessary to heat the material before using them. Fig. 68. 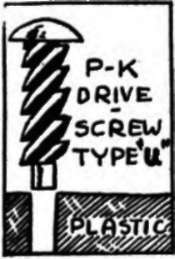 P-K Drive-Screw. With the point inserted in the hole, which must be properly sized, a hammer-blow drivee this screw in, cutting its own threads, and forming an unbreakable joint.